The Beara Breifne Way runs 500 km north from the tip of Beara Peninsula at Dursey in Co. Cork to Blacklion area in the Breifne area of Co Leitrim And Cavan, following generally the line of the 17th century march of O’Sullivan Beare, the last great chieftain of West Cork and South Kerry area. Chieftain of Beara. Following a series of battles and the loss of his stronghold, Dunboy Castle, O’Sullivan and his troops withdrew to Coomerkane Valley west of Glengarriff on the Beara Peninsula. On New year’s Eve, 1602, faced with almost certain starvation, they were finally forced to flee. a thousand men and women, including four hundred soldiers, embarked on an epic mid-winter march, hoping to join forces with rebel leaders in Ulster. Travelling through Ireland at a time of war and severe food shortages they were seen by local chiefs as a threat and were attacked. Women carried infants and many of the camp followers could not keep up. By the time they reached the river Shannon their numbers were severely reduced. Hemmed in by enemies, they crossed the river at night in a boat made of the hides of slaughtered horses, the meat eaten by the starving in the camp. two days later, at Aughrim, their path was blocked by cavalry and infantry. O’Sullivan Beare’s camp had no choice but to fight. against all odds, his exhausted band defeated greatly superior forces, then continued to march without a rest. as the mercenaries among O ’Sullivan’s followers began to drain away, returning to their Connaught homes, the remaining refugees were continuously threatened. on the fourteenth day, O ’Sullivan Beare reached Leitrim Castle, stronghold of the rebel O ’Rourke of Breifne. Of the original one thousand followers only thirty five remained. 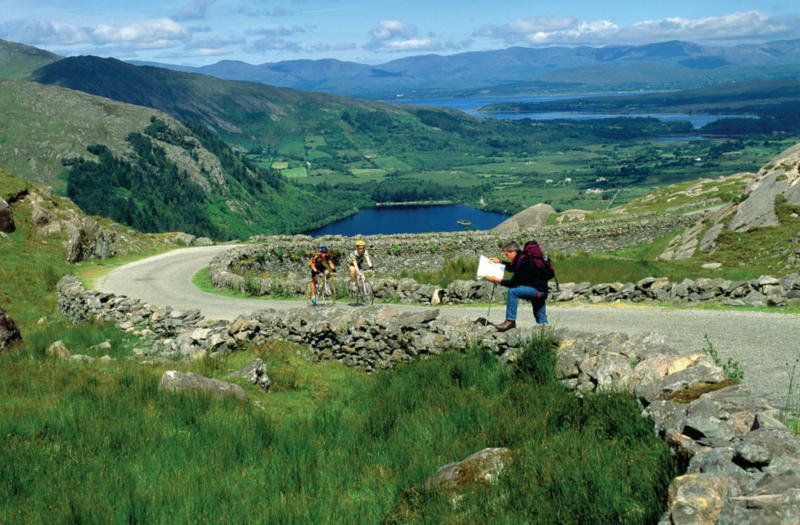 The dramatic history contrasts with the beauty and diversity of the landscapes along the Beara-Breifne way. the walk begins with a rugged coastline, then threads a barrier of hills. there are bogs and woodlands, riverbanks, rolling farmland and wayside villages. the route links counties Cork, Kerry, Limerick, Tipperary, Offaly, Galway, Roscommon, Sligo Leitrim and Cavan, and it also connects a series of rural communities along the entire way. The finer detail of the route is supported by strong folk memory and there are unbroken clan connections with the story. The 400th anniversary re-enactment of the march galvanised the route’s communities to develop the walk. The venture could only have come from the ground up; almost all the land used is in private hands and access has been granted, neighbour to neighbour, for the greater good of the wider community. the route may be nationwide but the sense of ownership and heritage is emphatically local. For the seasoned walker it is this local interaction which sets the Beara-Breifne way apart. 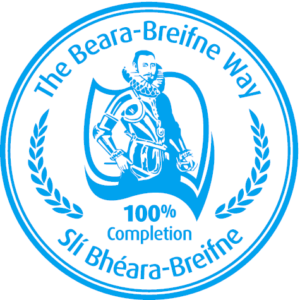 Walk part or all of the Beara-Breifne waymarked trail, meeting local communities and exploring the route’s heritage and culture as you walk.